Members of the winning seventh-grade team from Roxboro Middle School with their coach, Caitlin Gerber. Monticello and Roxboro middle school students wield a mighty power—the power of the pen. Last December, teams from both schools participated in the eighth Power of the Pen writing competition, hosted by Monticello at the Wiley campus. The stories generated in each session were judged on a series of criteria, including creativity, voice, grammar and spelling, and adherence to the assigned topic. Points were awarded to each student before they moved to the next room to compete against five different writers, using a new prompt. 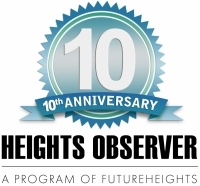 When the total points were tallied at day’s end, Heights’s middle school students did extremely well. 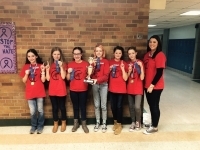 Roxboro’s seventh-grade team took the first prize, with Helena Duffy placing sixth overall, and Natalie Bier placing ninth. Monticello’s Laurel Buescher was the first-place winner in the seventh-grade competition, and Clare Dolan placed eighth amongst the eighth-graders. Those students, who practice once a week after school, will move on to the regional tournament in April. Top scorers in that event will then advance to the state tournament at the College of Wooster in May. Other Power of the Pen coaches are English language arts teachers Caitlin Gerber, Jeannise Andres and Ashley Riolo. Special support was provided by administrators Toia Robinson and Jeff Johnston, as well as the Heights Middle Schools PTA. 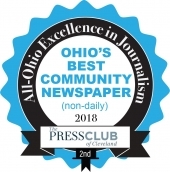 Krissy Dietrich Gallagher is a longtime resident of Cleveland Heights, and former teacher. She is a freelance journalist under contract with the CH-UH City School District.